Everything began in 2014 with an animated gif of a pigeon and a baguette (a popular form a bread in France) we saw while lurking on Tumblr. When we learned that Kéké would be at Annecy during its famous International Animation Film Festival, there was no excuse: we had to interview Kékéflipnote! Can you make a little presentation for our readers? I am Kévin Gemin and I just graduated from Émile Cohl, an animation school in Lyon, I was taught for 4 years. I studied more in the drawing and illustration field but I see myself more and more in animation and everything around it, even the advertising sector. I want to work, and it won't matter how, in animation.. So, you foretold my next question, how do you see yourself in the future: more into the directing thing, production or another, more technic, gig? The best would be to produce a show, or to work on one. I read on your tumblr that you made an internship in China, can you told us how you worked there ? Did you see some diffrence between here and there? At the begining, I was afraid of the misunderstanding because I don't speak the language. So I went there with a chinese friend who could translate for me and another friend what they wanted from us. We were three on that internship. But everything went well, I showed them what I was able to do on some software like TVPaint, Toon Boom Harmony or Flash. They worked at two departements: everything about 3D animation and the other, wich was the one where my interest went, was about 2D animation. They were very mindful, even if I was used to draw on my Nintendo 3DS because it's the the more practical tool for me. I can take it everywhere. I showed them what I could do, they saw the potential and the fact I was eager to animate on a computer, even if it wasn't my prefered device. They were surprised. Afeter that, they asked us if we wanted to work on one of their projects, an animated clip with a idol, Vocaloïd style, but in 2D animation. They gave us all the documents, the model sheets and let us work on it. Knowing we were french artists, they wanted something new from us, another to do the job, made diffrently from what they usually do. How did you felt this, that difference of work, between eastern and asian animation? I am glad and impressed to see people who are open to the idea that someone can draw on a DS, that's not something I think I would push forward as a quality in a professional area, where the softwares are primarly TVPaint and co. Beyond that, I was surprised to get so many incouraging messages on Tumblr and on my Facebook page, where people asked me to go forward because that's somthing they've never saw before. There is the graphic aspect, which has captured the eye of some, who saw it as pixel art, because I always use the same layers for the colors and the characters, that conveys a very peculiar digital feel. You talked about pixel art, what are your inspirations, where do you go and find some ideas ? When I was a kid, I played on the Super Nintendo and my pixel art universe is directly in debt from that fact. I liked how was 2D animation, the characters, the scrolling from left to right, everything in those games influenced me a lot. I love the way the color is used in the works of one of my favourite artist, Paul Robertson. When I saw on the web its animations for the first time, it was a real crush. He has a real mastering of pixels and colors. Paul Robertson is one of Kéké's infuences. At the beginning, when I worked on Flipnote, it was with the DSi first edition (before the 3DS) where I was just able to use two colors by layer. So I dealt with it and chose mine: black and red, that's the reason if you go back in my blog's archives, almost every drawing are black and red, or blue and red. Now I'm happier than ever: since March 31 Nintendo finally released Flipnote 3D! I was waiting for that since 2013. I looked forward to it because now there are so many color choices for the layers. Now I can use green, yellow and white and blend that in all the layers, with a limit of six colors. 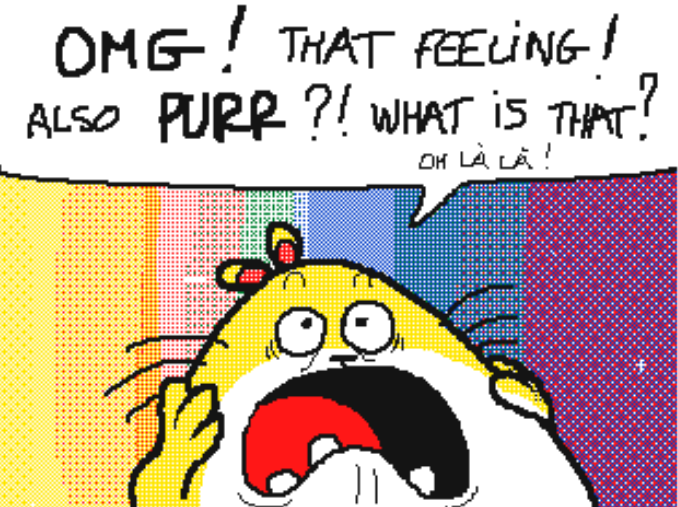 As a user of the 2009 edition of Flipnote en 2009, two colors were fine for me, but two more, that's just banana ! I will be able to go forward with that software and now my graduation is over, I'll work on the others, like TVPaint to grind and learn, and see how all of that will bring to me. Let's talk about your pigeon, baguettes and fox obsession, where the hell is that came from? One day, I was coming home and I stumbled upon a pigeon which was turning around a trashcan. I stayed a little to watch it. I asked myself "that's so weird, didn't it get it goes in circles since, like ten minutes or whatever!" It took place in front of the City Hall of Annemasse. It was stupid but oddly fascinating. 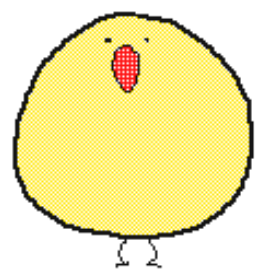 So, on my DS, I had done a bouncing ball animation and I tought: "What if a change this ball into a pigeon?" I added an head and some little legs to that ball, it had some sort of “stretch and squash” effect, it made me laugh! I showed it to my little brother who told me: "You should put that on the web, I don't know why but you should." So I continued to make other pictures beside that, bit it didn't worked as well as that pigeon wearing its afro. So i drew a baguette and some pigeons pecking around. I added more and more and so on, there was a whole flock. These animations did well, it became viral. The positive thing with these pigeons, they make me laugh and I do something people like on the web. Sometimes I feel lucky people on the web like my pigeons. It's also a kind of a signature I created, people recognize instantly my craft, my pigeons, I found myself and the web contributed to that. 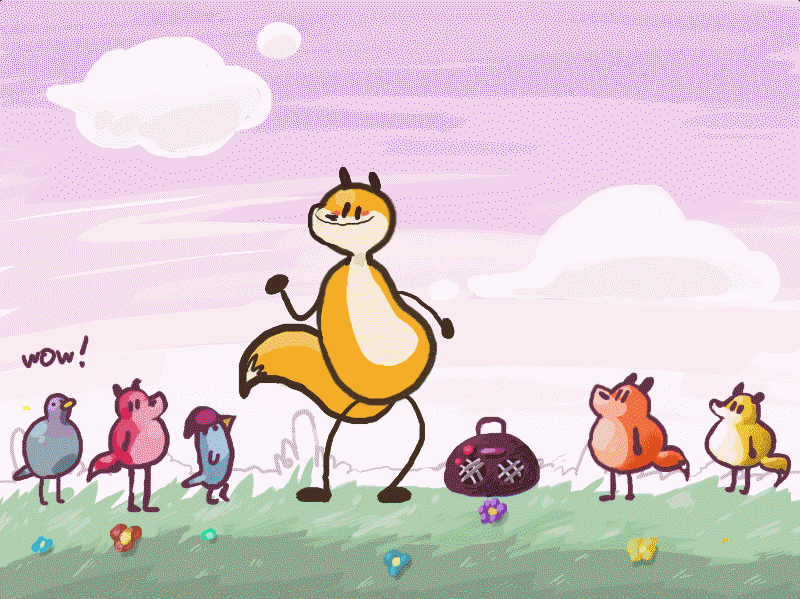 And i added some foxes. Fox, for me, is a very spiritual animal, very precious, so beautiful and I thought it could be fun to make it bounce and eat baguettes, like the pigeons. (laughs) I have to write this on the web ! But it's true, we live with these pigeons all the time, we don't care about them. When you ask someone which animal is his favorite I think there is roughly 2% of probabilities they answer "pigeon"! (laughs) I don't know what you think of it but who knows, maybe you'll do a compilation of your animations in the future? Ideally, I would like to make a short film, it would be so awesome! For now, I've still some difficulties to grasp the fact that my animations make people happy. I'm moved when I get some mails from people who felt better simply by watching my animations, whereas they lived some difficult times. At the beginning, I was just for fun and I didn't see that side of it. That's when it happened I understood I could convey some emotions with my animations, which is my passion, and that incouraged my to follow that way. I'm sharing my passion with the whole world and I make some posts in english and in french. Those who speak english anglais like to learn some words in french and my pigeons don't speak but are in motion, and motion is an universal language. I would be such a constraint to be bound by one language. There are even some animators from Cartoon Network who came to see my work! Kéké continues to publish some gifs and animations on his tumblr and on his Facebook page. Next year, he'll be at the Annecy International Animation Film Festival as a professional ! Recruiters, please meet him (and his pigeons)! All our thanks to the Alexandra Hotel lovely employees who borrowed us a place to make that interview.